Oh my, I didn't realise I hadn't posted for a week! Time has just run away with me. Here is a super quick project I whipped up using the Simply Fabulous Simply Sent card kit. Card kits are so handy to have around, especially when you need a card in a hurry, or perhaps, new to card making. This gorgeous kit includes enough product for 8 postcard type cards. The main feature is the lovely lattice die cut postcard. 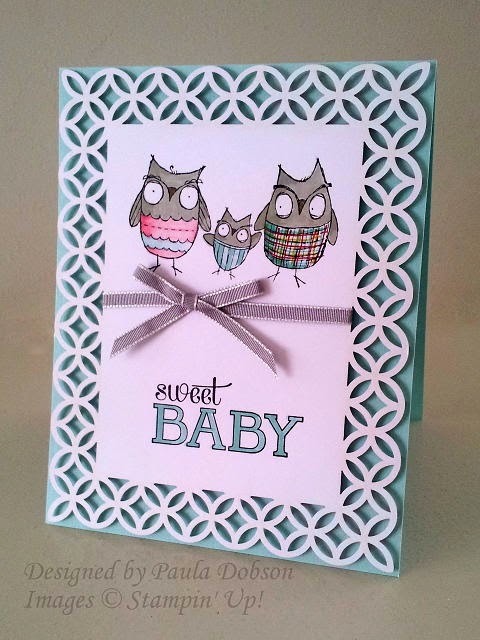 One of the Just Add Ink Design Team members recently added to her family and this was the card I sent her to welcome the new arrival. I love the Owl family! I coloured each image in with my Stampin' Write Markers and put drew a tartan on the Dad owl, lol. I added a ribbon, which is also included in the kit, around the middle for a bit of "pop". I adhered the die cut with Dimensionals on a card base so I could write the message inside. JOIN IN AT JUST ADD INK!